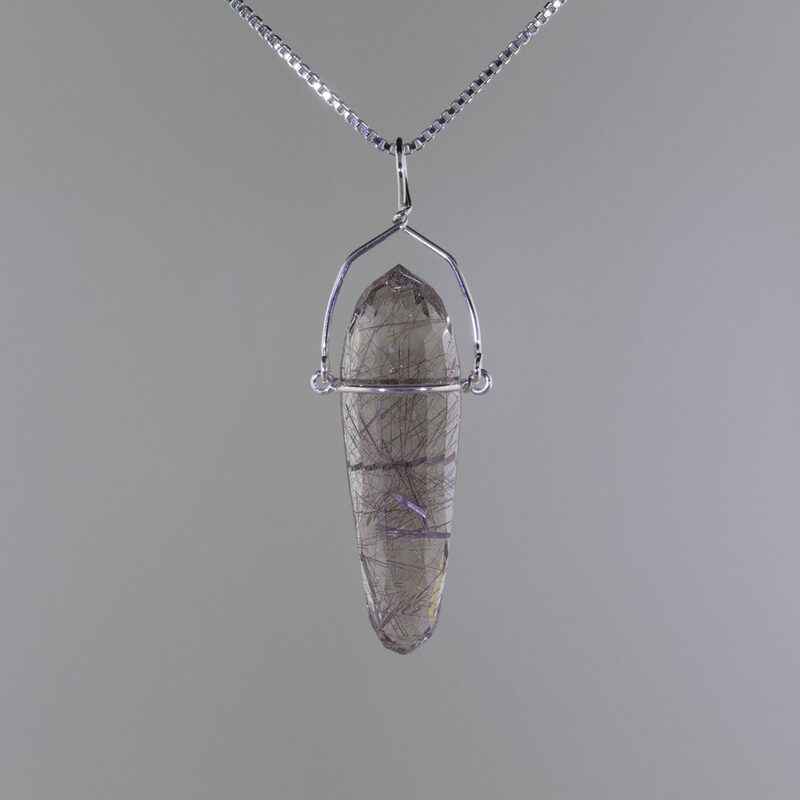 Faceted quartz with bronze rutile in sterling silver. © Hashnu Stones & Gems. Used with permission. I’ve always found inclusions in minerals fascinating. 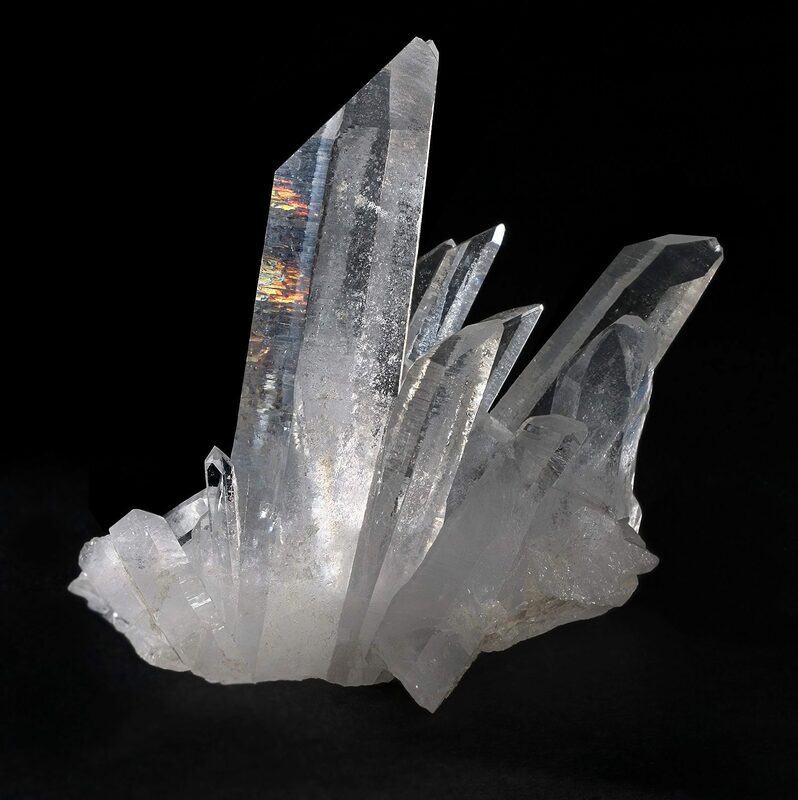 Recently, I perused 150 pounds of old stock rutilated quartz I’d received as part of my purchase of the Creative Gems natural facet grade rough business. I decided to facet and cab several select pieces because of their rutile inclusions. Although the finished gems satisfied me, I wasn’t excited about the presentation of the rutile in the quartz. I realized then that these minerals could be better appreciated and displayed if I could cut a gemstone that could be viewed from any angle. 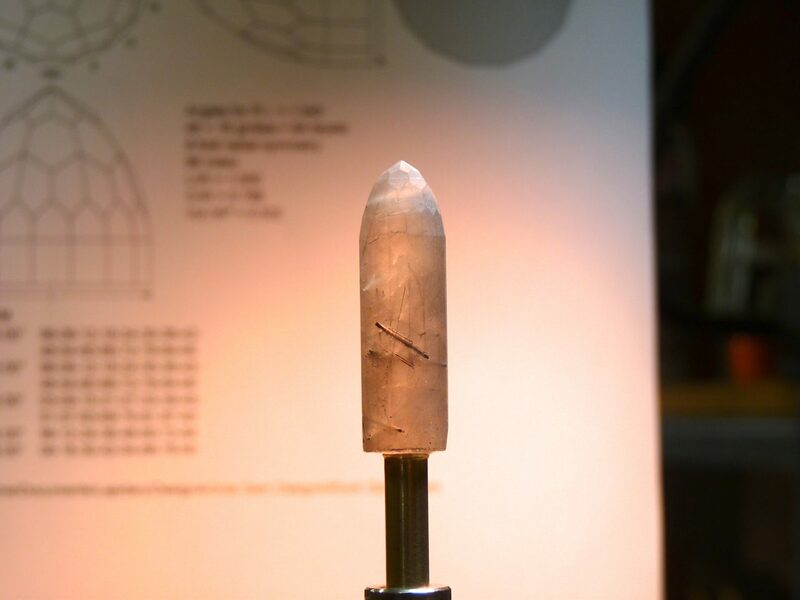 Mindful of the long nature of rutile needles, I considered an elongated design. 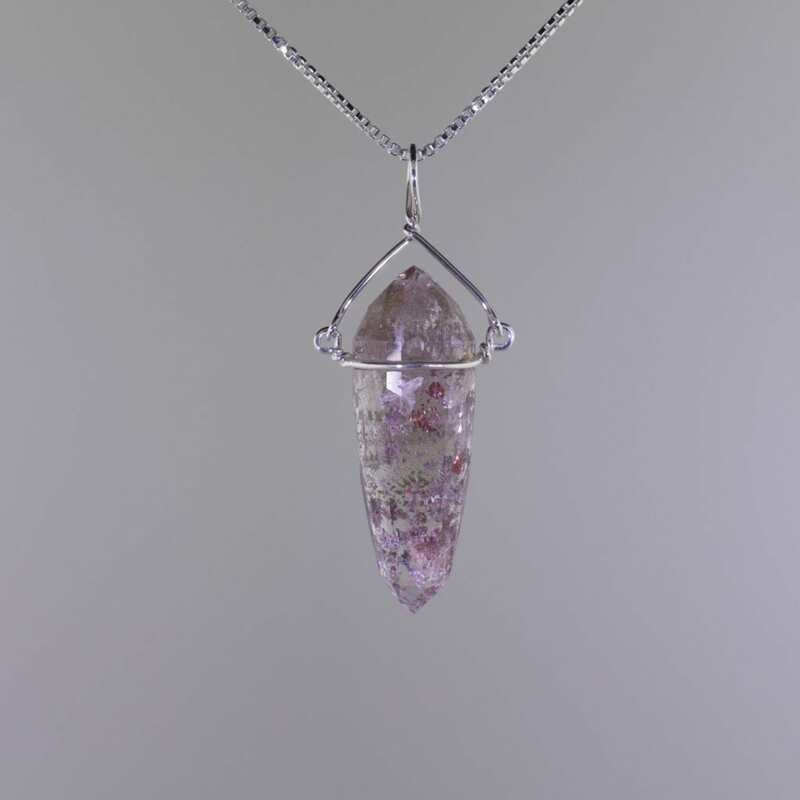 Stretching that design for all-around viewing led me to choose a gemstone pendulum form. In my first sketches, the pendulum form looked smooth and cabochon-like. Although I was getting a full view of the rutile and other inclusions, I found the design somewhat less than flashy. So, I decided to facet the pendulum, instead. 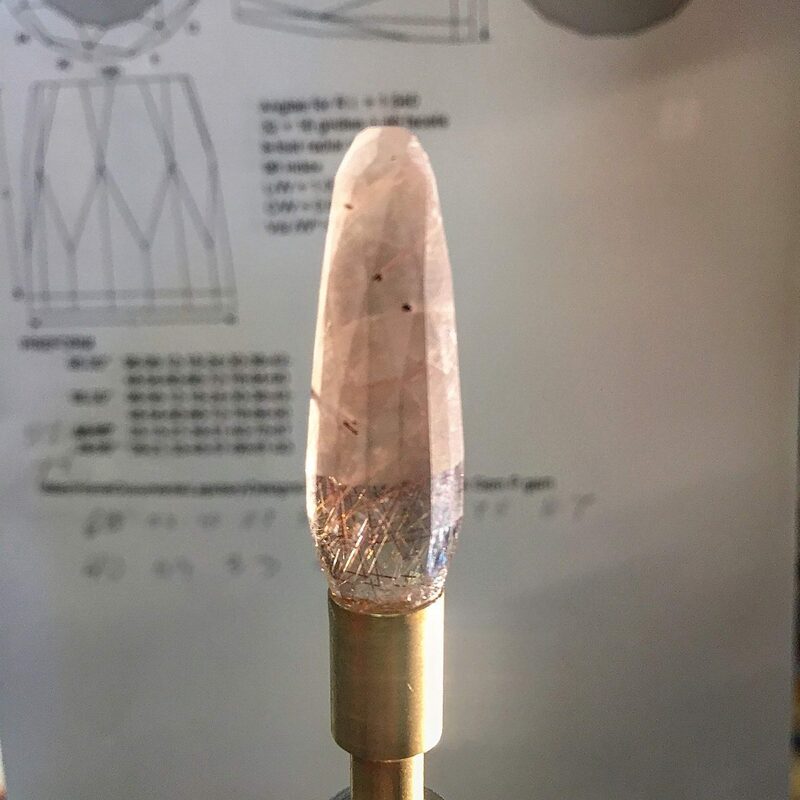 Faceting an elongated design of 1 to 3 inches posed some challenges for me and my current set of tools. This is where the fun began. 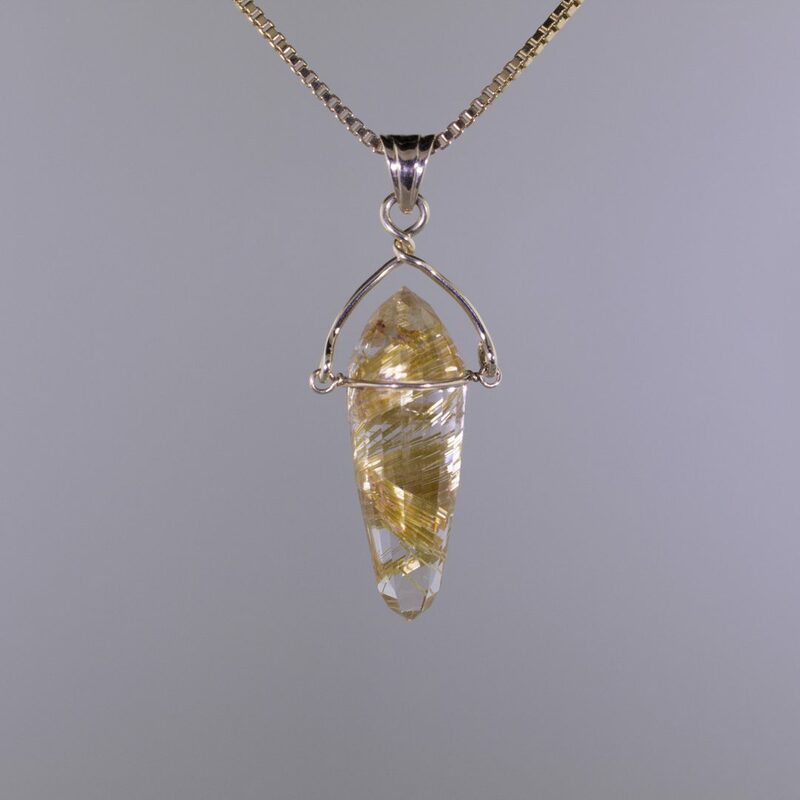 Once I had the design and process for cutting a faceted rutilated quartz pendulum, I then had to solve the design challenge of presenting the gemstone as an attractive jewelry piece. Again, I wanted to display the finished gemstone so the beholder could enjoy the finished piece from all angles. I quickly decided to carve a concave girdle into the pendant. This would let me grasp the faceted gemstone pendulum without covering it with a bulky metal structure. This worked out better than expected. My talented local fine goldsmith devised a simple but sophisticated technique. He used the concave girdle to suspend the gemstone pendulum from a chain. 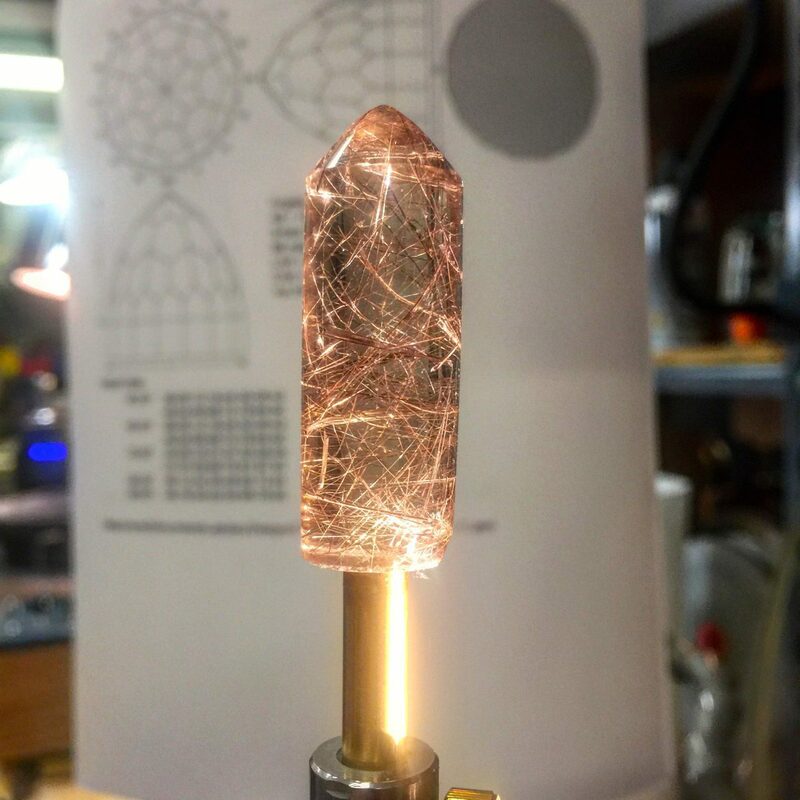 The following tutorial explains how I designed, faceted, and put concave girdles in my rutilated quartz pendulums. I first sketched my faceted gem designs with pencil and paper. Then, GemCad became my primary tool. Here, I ran into my first challenge. 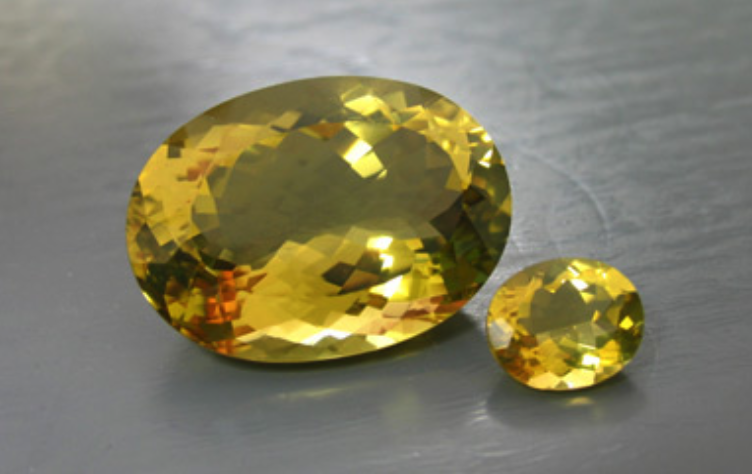 GemCad is programed to design traditional gemstone proportions. In order to get my full design in GemCad, I had to create three separate drawings and then combine them. The first drawing included the crown and girdle of the pendulum. The second covered the girdle and top half of the pavilion. The third showed the bottom half of the pavilion and culet. 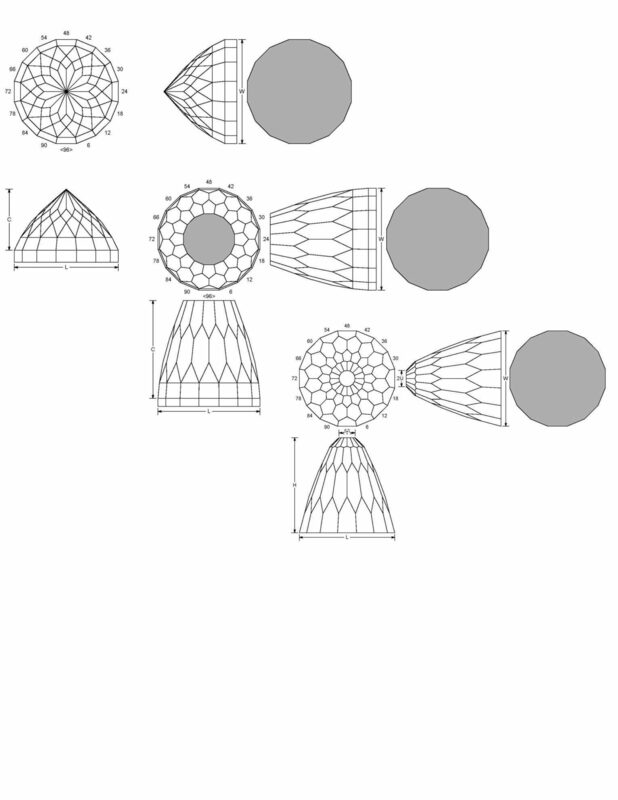 Three GemCad designs for full pendulum. © Hashnu Stones & Gems. Used with permission. Start by faceting the pendulum on the crown. The crown provides a better finished shape for a snug fit in the dop when transferring the gemstone. Pendulum preform. © Hashnu Stones & Gems. Used with permission. Next, carve off half the preform (dop end) at a slight angle, so you won’t spend more time than necessary cutting an elongated 90° facet. (See below). For this, I used my Diamond Pacific Genie. Preform tapered. © Hashnu Stones & Gems. Used with permission. Don’t polish the girdle, since it can be significantly long and you’ll recut it when faceting the pavilion. 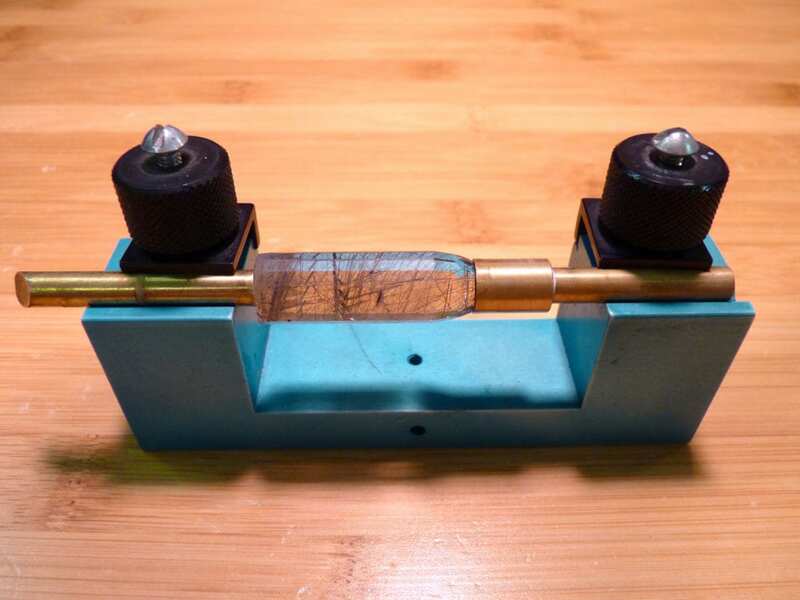 Due to the length of the pendulum, use a transfer jig longer than traditional ones. I use this older and longer transfer jig for transferring long stones. © Hashnu Stones & Gems. Used with permission. When faceting the pendulum pavilion, hold the stone, not the mast handle. Given the stone’s length, don’t put stress on the stone/dop attachment. Hold the stone. © Hashnu Stones & Gems. Used with permission. You may need to use a mast riser for the lower pavilion facets and culet (again, due to the stone’s length). 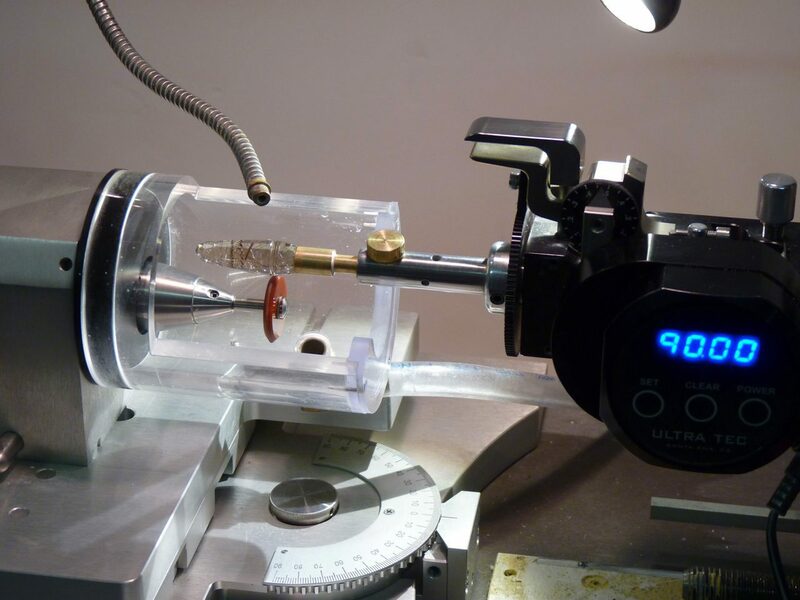 I used a 2” mast riser to put in the culet on an Ultra Tec V5 faceting machine. © Hashnu Stones & Gems. Used with permission. Take your time when cutting the pavilion. This could be a very large surface area to facet. (I made this go easier by pre-polishing the facets with the Hyper-Edge 8,000 grit diamond lap). 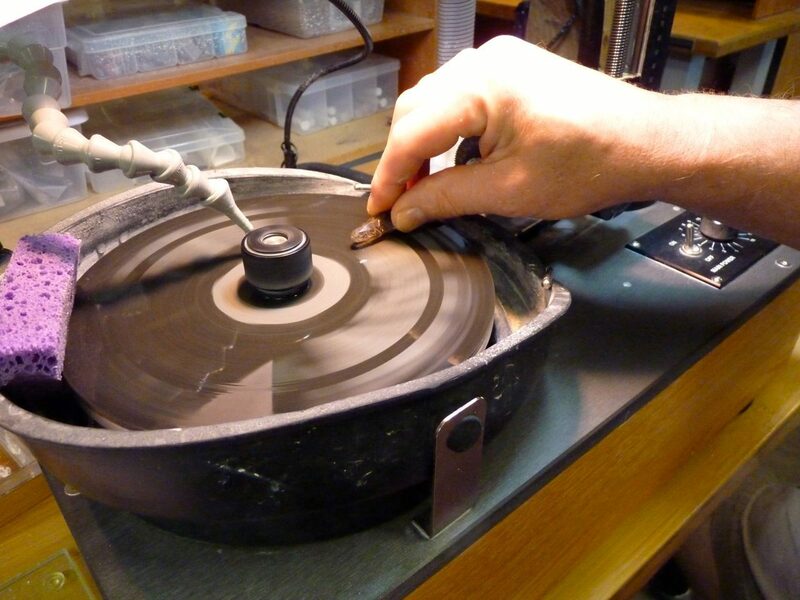 Faceting large surface areas. © Hashnu Stones & Gems. Used with permission. Add a culet to the pendulum so it doesn’t stab the jewelry wearer. I used a diamond coated V Wheel on the Ultra Tec Fantasy Machine to carve the concave girdle. Do a test cut with the index in a fixed position to make sure you have the right alignment and depth. Without adjusting the height of the mast, lock out the segment so that the index gear can free rotate and carve the concave girdle around the complete stone. If you need deeper concavity, lower the stone. 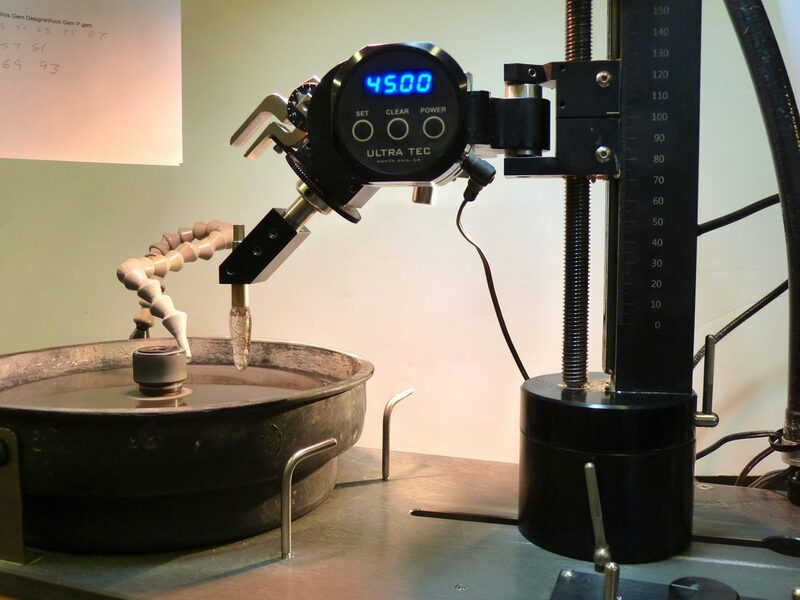 I used a phenolic V Wheel with diamond to bring the concave girdle to the desired polish. I polished the concave girdle on the Ultra Tec Fantasy Machine. © Hashnu Stones & Gems. Used with permission. Set the gemstone by creating a large jump ring and twisting the two opposite sides until the ring fits snugly in the concave girdle. Then, attach another ring over the top of the stone. Fasten it into the first ring’s eyelets and add a bail to the second ring. Simple gemstone setting. 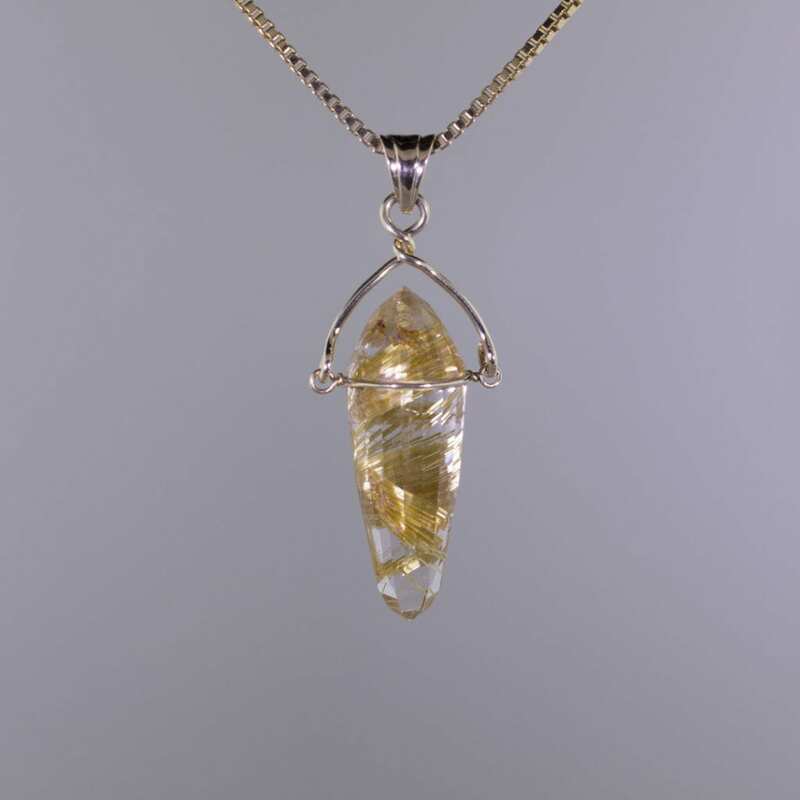 Faceted quartz with gold rutile in 14K gold. © Hashnu Stones & Gems. Used with permission. After I did eight rutilated quartz pendulums, I started experimenting with other gemstones, such as moldavite, sugilite, and opal. I used opal from the Welo District of Ethiopia, one of my favorite stones to facet. 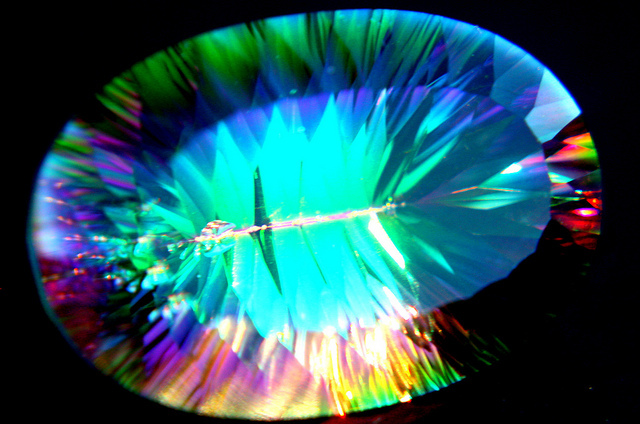 (If you try opal, be very careful and remember opal’s soft nature). This faceted opal pendulum came out looking somewhat futuristic. So, I sent it to my progressive jewelry design friends at Buffalo Craft Company for setting. They designed a fascinating white gold and diamond piece to cradle the opal. In order to attach the setting to the concave girdle of the pendulum without stressing the opal, the innovative goldsmith at Buffalo Craft Company fabricated a multi-component setting. It interlocked and screwed together, safely nestling the opal in a stunning piece of modern jewelry. This fascinating pendant will be released by the Buffalo Craft Company in the near future. Look for it in 2017. Mark Oros sells facet grade rough gem material, Ultra Tec Faceting and Fantasy machines, and designs and facets gemstones at his studio, Hashnu Stones and Gems. You can find his work on his website, including the finished pendulum jewelry. Gemstone broker Adam Pollack’s website, AP Colored Stones, also features additional pendulums. Faceted quartz with chlorite and rutile in sterling silver. © Hashnu Stones & Gems. Used with permission.